What a great idea! I especially like the grass on the roof. I wonder if it helps insulate the building. Do they use the goats for anything or are they pets? 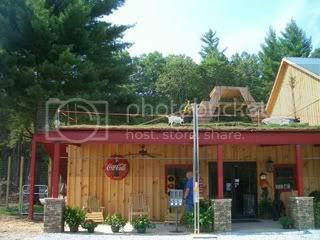 Yes, the sod roof helps insulate. My spouse has been talking about the value of this type of building for years. This particular store only uses their cute little goats as advertisement and a petting pen on the side. The steel post works for a feeding bucket which you buy a quarter's worth of grain then run it up to them. As they know the sound, they flock to it prior to the bell ringing, lol. The store does sell fresh goat products; Milk, goat cheese... (I saw no sign of goat meat.) 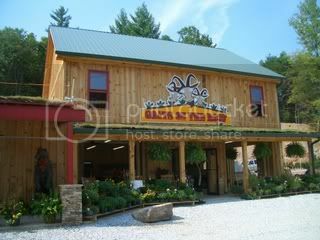 They also sell fresh farm produce, drinks and ice cream. 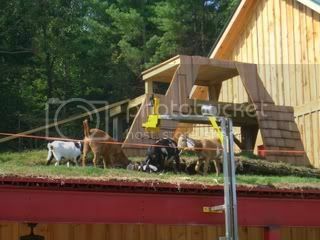 The goats have/can jump down without injury but they prefer staying in the pen and on the roof. The store has farm fencing and large gates they can close to prevent one of the cuties from getting out onto the hwy if it should jump down. The only time it's happened, the sweetie went around to to get back in, lol.